Puzzle Game and RPG in One Package? Say it ain't so! As a matter of fact, it is so. I don't have any new games to review this week so I thought I would dig into my old bag of goodies. Actually this is an oldie and a newbie. I played it when it first came out on Xbox in 2010 and I just realized with my new Samsung Android phone that they're giving it away free in the App Store. I can only hope there aren't more charges to come as I already bought this game once. I checked and the Apple Store also has a free version they're calling "Freemium" which I guess means you get the full game for free. They still list the $3.99 version, but why would you do that when the free one is right there next to it? As stated before, this game is half-puzzle and half-RPG. The puzzle half is very similar to Bejeweled. You have to match three or more similar gems in a row in order to proceed. If you match four gems in a row, you get an extra turn. Whatever color gem you match increases your mana of the same color. Mana is what you use to fuel attack and protection spells. If you match skulls, it does immediate damage to your enemy. If you match those little pieces that look like iron fists, you can use them for weapon attacks, personal defense, or potions/poisons. As you travel through Verloren, you will encounter citizens in need of aid and goblins in need of killing. All of this battle takes place on the gem board. As the game progresses, the enemies become more and more difficult, but if you've done a good job leveling up you shouldn't have a problem. Spend a little time researching your character before you start and it will pay dividends once you hit the real tough guys. This game maybe a couple years old, but it holds up well. 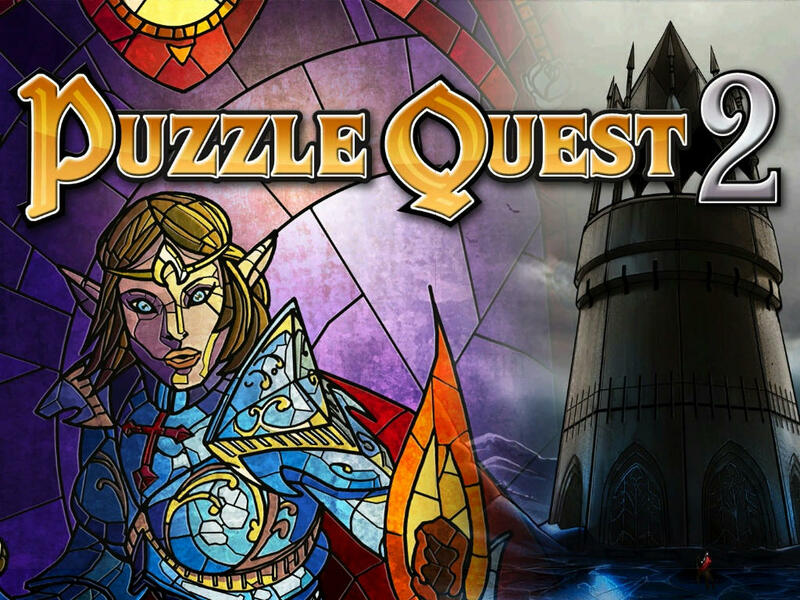 There appears to be no difference between the console and the portable versions that I can tell, and I would notice since Puzzle Quest 2 is all I'm playing on my phone these days. If you're a fan of Bejeweled or Tetris, give this a try. You might just enjoy the RPG aspects. If you're an RPG fan, you might find the battle a bit tedious so try this on your phone for free first. If you like it, you might consider getting the full version so you can play on a big screen. I'm not a huge fan of either genre, but when combined as masterfully as they are in this game, I can't resist. Bonuses: +1 for combining two game formats that rarely meet in puzzle and RPG. Penalties: None that I can think of. For what it is, this game is near-perfect. Nerd Coefficient: 8/10 Well worth your time and attention (but try it on a phone first for free to make sure you like it! ).